Hi folks. Well if you read my last post (and why wouldn’t you!?!!) then you’ll know that I have discovered the wonder that is cake baking. I have always liked eating cake (who doesn’t) but baking them never really interested me. Oh how all that has changed! I need to rein myself in or I will end up the size of a house! Preheat your oven to 200oC or Gas Mark 6. Mix the dry ingredients, minus the raisins, together then add the butter and rub in with your fingers till the mixture resembles breadcrumbs. 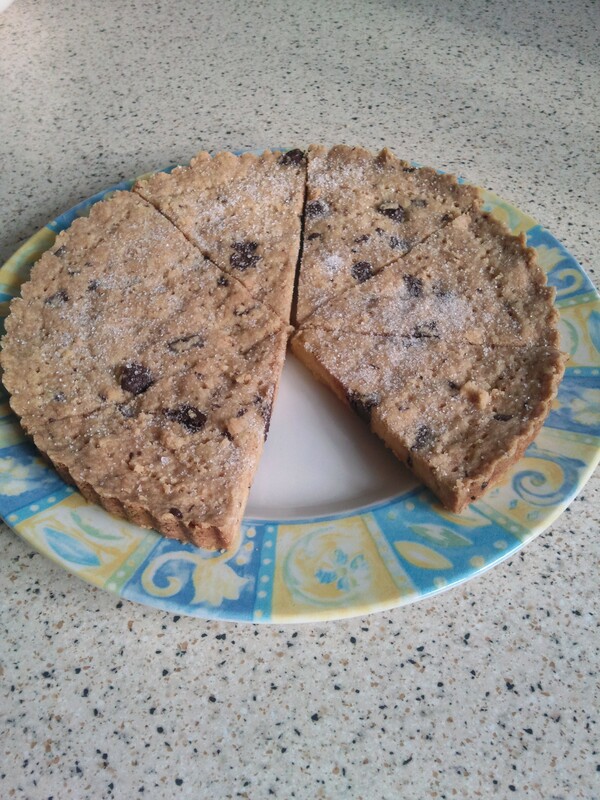 Mix the egg, vanilla and milk/cream together then add to the breadcrumb mixture, along with the raisins to form a dough. Try not to work the mixture too much as you want the dough to remain light. You could do this in a food processor but I always prefer to do it by hand. Roll the dough out onto a lightly floured surface till it is about 4-5cm thick. Next take a pastry cutter and cut out your scones – one tip here; try to press the cutter straight down and DON’T twist as this will give you a better rise in the oven. Place the cut scones onto a lightly greased baking tray and brush the tops with milk or beaten egg to form a nice glaze. Bake in the preheated oven for about 15 minutes till they are nice and golden. To check they are cooked use a cocktail stick – stick it into the scone and remove; if it comes out clean you know they are cooked. 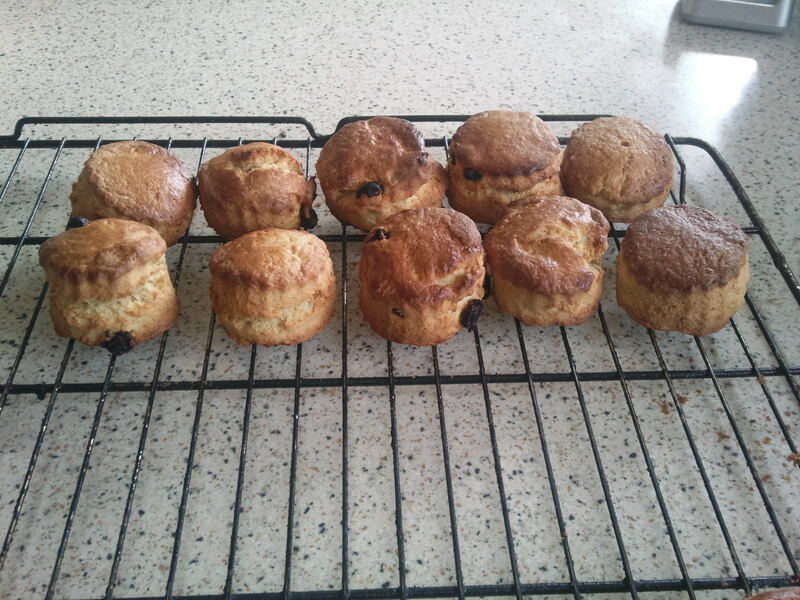 Place the scones on a wire rack and leave to cool for a few minutes. They are best enjoyed warm. Well all I can say is that these are light and delicious. They have to be served with clotted cream and jam (raspberry or strawberry preferably). Try them for yourselves and enjoy. If you do give them a go I would love to know what you think. Well folks, it’s been a while since my last post! The last few months have marked a period of turbulence and change in my life. I only hope things will begin to settle down soon. On the plus side, my baking has gone from strength to strength. I used to be a pure bread baker, but with 4 kids it was inevitable that I would eventually branch out into the wonderful world of cakes! And I absolutely love it. My wife is amazed at my results – she says that I seem to be a naturally gifted baker, praise indeed. So over the coming weeks I will be sharing my newfound baking exploits with you, and giving you the recipes I used to get my great results. I hope you enjoy them as much as I do.